unbound sheets, 13 x 18 cm. growing closely from one point. 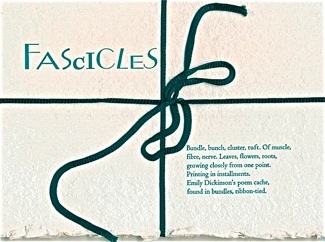 Fifteen small broadsides of poems by Merle Lyn Bachman, Margaret Butterfield, Catalina Cariaga, Gillian Conoley, Frances Jaffer, Susan Gevirtz, Brenda Hillman, Jen Hofer, Laura Mullen, Elizabeth Robinson, Jaime Robles, Rena Rosenwasser, Cole Swensen, H.T. [Heather Thomas]., and Robin Tremblay-McGraw.